Prevention is by avoiding risk factors including smoking and air pollution. Treatment and long-term outcomes depend on the type of cancer, the stage (degree of spread), and the person's overall health. Most cases are not curable. Common treatments include surgery, chemotherapy, and radiotherapy. NSCLC is sometimes treated with surgery, whereas SCLC usually responds better to chemotherapy and radiotherapy. Passive smoking—the inhalation of smoke from another's smoking—is a cause of lung cancer in nonsmokers. A passive smoker can be defined as someone living or working with a smoker. Studies from the US, Europe and the UK have consistently shown a significantly increased risk among those exposed to passive smoke. Those who live with someone who smokes have a 20–30% increase in risk while those who work in an environment with secondhand smoke have a 16–19% increase in risk. Investigations of sidestream smoke suggest it is more dangerous than direct smoke. Passive smoking causes about 3,400 deaths from lung cancer each year in the USA. Radon is a colourless and odorless gas generated by the breakdown of radioactive radium, which in turn is the decay product of uranium, found in the Earth's crust. The radiation decay products ionize genetic material, causing mutations that sometimes turn cancerous. Radon is the second-most common cause of lung cancer in the USA, causing about 21,000 deaths each year. The risk increases 8–16% for every 100 Bq/m³ increase in the radon concentration. Radon gas levels vary by locality and the composition of the underlying soil and rocks. About one in 15 homes in the US has radon levels above the recommended guideline of 4 picocuries per liter (pCi/l) (148 Bq/m³). Outdoor air pollutants, especially chemicals released from the burning of fossil fuels, increase the risk of lung cancer. Fine particulates (PM2.5) and sulfate aerosols, which may be released in traffic exhaust fumes, are associated with slightly increased risk. For nitrogen dioxide, an incremental increase of 10 parts per billion increases the risk of lung cancer by 14%. Outdoor air pollution is estimated to account for 1–2% of lung cancers. Tentative evidence supports an increased risk of lung cancer from indoor air pollution related to the burning of wood, charcoal, dung or crop residue for cooking and heating. Women who are exposed to indoor coal smoke have about twice the risk and a number of the by-products of burning biomass are known or suspected carcinogens. This risk affects about 2.4 billion people globally, and is believed to account for 1.5% of lung cancer deaths. About 8% of lung cancer is due to inherited factors. In relatives of people with lung cancer, the risk is doubled. This is likely due to a combination of genes. Polymorphisms on chromosomes 5, 6 and 15 are known to affect the risk of lung cancer. Metastasis of lung cancer requires transition from epithelial to mesenchymal cell type. This may occur through activation of signaling pathways such as Akt/GSK3Beta, MEK-ERK, Fas, and Par6. Lung cancer often appears as a solitary pulmonary nodule on a chest radiograph. However, the differential diagnosis is wide. 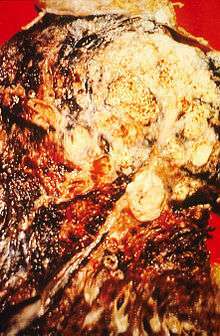 Many other diseases can also give this appearance, including metastatic cancer, hamartomas, and infectious granulomas such as tuberculosis, histoplasmosis and coccidioidomycosis. Lung cancer can also be an incidental finding, as a solitary pulmonary nodule on a chest radiograph or CT scan done for an unrelated reason. The definitive diagnosis of lung cancer is based on histological examination of the suspicious tissue in the context of the clinical and radiological features. 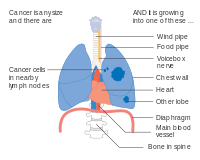 Nearly 40% of lung cancers are adenocarcinoma, which usually originates in peripheral lung tissue. Although most cases of adenocarcinoma are associated with smoking, adenocarcinoma is also the most common form of lung cancer among people who have smoked fewer than 100 cigarettes in their lifetimes ("never-smokers") and ex-smokers with a modest smoking history. A subtype of adenocarcinoma, the bronchioloalveolar carcinoma, is more common in female never-smokers, and may have a better long-term survival. In small-cell lung carcinoma (SCLC), the cells contain dense neurosecretory granules (vesicles containing neuroendocrine hormones), which give this tumor an endocrine/paraneoplastic syndrome association. Most cases arise in the larger airways (primary and secondary bronchi). Sixty to seventy percent have extensive disease (which cannot be targeted within a single radiation therapy field) at presentation. 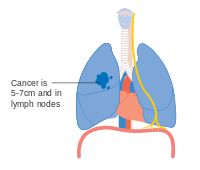 Lung cancer staging is an assessment of the degree of spread of the cancer from its original source. It is one of the factors affecting the prognosis and potential treatment of lung cancer. The evaluation of non-small-cell lung carcinoma (NSCLC) staging uses the TNM classification. This is based on the size of the primary tumor, lymph node involvement, and distant metastasis. Using the TNM descriptors, a group is assigned, ranging from occult cancer, through stages 0, IA (one-A), IB, IIA, IIB, IIIA, IIIB and IV (four). This stage group assists with the choice of treatment and estimation of prognosis. Small-cell lung carcinoma (SCLC) has traditionally been classified as "limited stage" (confined to one half of the chest and within the scope of a single tolerable radiotherapy field) or "extensive stage" (more widespread disease). However, the TNM classification and grouping are useful in estimating prognosis. For both NSCLC and SCLC, the two general types of staging evaluations are clinical staging and surgical staging. Clinical staging is performed prior to definitive surgery. It is based on the results of imaging studies (such as CT scans and PET scans) and biopsy results. Surgical staging is evaluated either during or after the operation, and is based on the combined results of surgical and clinical findings, including surgical sampling of thoracic lymph nodes. The U.S. Preventative Services Task Force (USPSTF) recommends yearly screening using low-dose computed tomography in those who have a total smoking history of 30 pack-years and are between 55 and 80 years old until a person has not been smoking for more than 15 years. Screening should not be done in those with other health problems that would make treatment of lung cancer if found not an option. The English National Health Service was in 2014 re-examining the evidence for screening. The long-term use of supplemental vitamin A, vitamin C, vitamin D or vitamin E does not reduce the risk of lung cancer. Some studies suggest that people who eat diets with a higher proportion of vegetables and fruit tend to have a lower risk, but this may be due to confounding—with the lower risk actually due to the association of a high fruit/vegetables diet with less smoking. More rigorous studies have not demonstrated a clear association between diet and lung cancer risk. Worldwide, lung cancer is the most common cancer among men in terms of both incidence and mortality, and among women has the third highest incidence, and is second after breast cancer in mortality. In 2012, there were 1.82 million new cases globally, and 1.56 million deaths due to lung cancer, representing 19.4% of all deaths from cancer. The highest rates are in North America, Europe and East Asia, with over a third of new cases in 2012 in China. Rates in Africa and South Asia are much lower. The population segment most likely to develop lung cancer is people aged over 50 who have a history of smoking. In contrast to the mortality rate in men, which began declining more than 20 years ago, women's lung cancer mortality rates have been rising over the last decades, and are just recently beginning to stabilize. In the USA, the lifetime risk of developing lung cancer is 8% in men and 6% in women. For every 3–4 million cigarettes smoked, one lung cancer death occurs. The influence of "Big Tobacco" plays a significant role in the smoking culture. Young nonsmokers who see tobacco advertisements are more likely to take up smoking. The role of passive smoking is increasingly being recognized as a risk factor for lung cancer, leading to policy interventions to decrease undesired exposure of nonsmokers to others' tobacco smoke. In the United States, black men and women have a higher incidence. Lung cancer rates are currently lower in developing countries. With increased smoking in developing countries, the rates are expected to increase in the next few years, notably in China and India. In the United States military veterans have a 25-50% higher rate of lung cancer primarily due to higher rates of smoking. During World War Two and the Korean War asbestos also played a part and Agent Orange may have caused some problems during the Vietnam War. From the 1960s, the rates of lung adenocarcinoma started to rise relative to other types of lung cancer. This is partly due to the introduction of filter cigarettes. The use of filters removes larger particles from tobacco smoke, thus reducing deposition in larger airways. However, the smoker has to inhale more deeply to receive the same amount of nicotine, increasing particle deposition in small airways where adenocarcinoma tends to arise. The incidence of lung adenocarcinoma continues to rise. The first successful pneumonectomy for lung cancer was performed in 1933. Palliative radiotherapy has been used since the 1940s. Radical radiotherapy, initially used in the 1950s, was an attempt to use larger radiation doses in patients with relatively early-stage lung cancer, but who were otherwise unfit for surgery. In 1997, continuous hyperfractionated accelerated radiotherapy was seen as an improvement over conventional radical radiotherapy. With small-cell lung carcinoma, initial attempts in the 1960s at surgical resection and radical radiotherapy were unsuccessful. In the 1970s, successful chemotherapy regimens were developed. Epigenetics is the study of small, usually heritable, molecular modifications—or "tags"—that bind DNA and modify gene expression levels. Targeting these tags with drugs can kill cancer cells. Early-stage research in NSCLC using drugs aimed at epigenetic modifications shows that blocking more than one of these tags can kill cancer cells with fewer side effects. Studies also show that giving patients these drugs before standard treatment can improve its effectiveness. Clinical trials are underway to evaluate how well these drugs kill lung cancer cells in humans. Several drugs that target epigenetic mechanisms are in development. Histone deacetylase inhibitors in development include valproic acid, vorinostat, belinostat, panobinostat, entinostat, and romidepsin. DNA methyltransferase inhibitors in development include decitabine, azacytidine, and hydralazine. 1 2 3 4 5 6 7 "Lung Carcinoma: Tumors of the Lungs". Merck Manual Professional Edition, Online edition. Retrieved 15 August 2007. ↑ "Non-Small Cell Lung Cancer Treatment –Patient Version (PDQ®)". NCI. May 12, 2015. Retrieved 5 March 2016. ↑ Falk, S; Williams, C (2010). "Chapter 1". Lung Cancer—the facts (3rd ed.). Oxford University Press. pp. 3–4. ISBN 978-0-19-956933-5. 1 2 World Cancer Report 2014. World Health Organization. 2014. pp. Chapter 5.1. ISBN 9283204298. 1 2 "Lung Cancer—Patient Version". NCI. Retrieved 5 March 2016. 1 2 3 4 5 6 7 8 9 10 11 12 13 14 15 16 17 18 19 20 21 22 23 24 Horn, L; Lovly, CM; Johnson, DH (2015). "Chapter 107: Neoplasms of the lung". In Kasper, DL; Hauser, SL; Jameson, JL; Fauci, AS; Longo, DL; Loscalzo, J. Harrison's Principles of Internal Medicine (19th ed.). McGraw-Hill. ISBN 978-0-07-180216-1. 1 2 3 4 5 6 Alberg, AJ; Brock, MV; Samet, JM (2016). "52: Epidemiology of lung cancer". Murray & Nadel's Textbook of Respiratory Medicine (6th ed.). Saunders Elsevier. ISBN 978-1-4557-3383-5. 1 2 O'Reilly, KM; Mclaughlin AM; Beckett WS; Sime PJ (March 2007). "Asbestos-related lung disease". American Family Physician. 75 (5): 683–688. PMID 17375514. ↑ "Tobacco Smoke and Involuntary Smoking" (PDF). IARC Monographs on the Evaluation of Carcinogenic Risks to Humans. WHO International Agency for Research on Cancer. 83. 2004. There is sufficient evidence that involuntary smoking (exposure to secondhand or 'environmental' tobacco smoke) causes lung cancer in humans. ... Involuntary smoking (exposure to secondhand or 'environmental' tobacco smoke) is carcinogenic to humans (Group 1). 1 2 3 4 5 6 7 8 9 10 11 12 13 14 Lu C, Onn A, Vaporciyan AA, et al. (2010). "78: Cancer of the Lung". Holland-Frei Cancer Medicine (8th ed.). People's Medical Publishing House. ISBN 978-1-60795-014-1. 1 2 3 4 5 6 Collins, LG; Haines C; Perkel R; Enck RE (January 2007). "Lung cancer: diagnosis and management". American Family Physician. American Academy of Family Physicians. 75 (1): 56–63. PMID 17225705. ↑ "Lung Cancer Prevention–Patient Version (PDQ®)". NCI. November 4, 2015. Retrieved 5 March 2016. ↑ Chapman, S; Robinson G; Stradling J; West S (2009). "Chapter 31". Oxford Handbook of Respiratory Medicine (2nd ed.). Oxford University Press. ISBN 978-0-19-954516-2. 1 2 "Surveillance, Epidemiology and End Results Program". National Cancer Institute. Retrieved 5 Mar 2016. 1 2 Majumder, edited by Sadhan (2009). Stem cells and cancer (Online-Ausg. ed.). New York: Springer. p. 193. ISBN 978-0-387-89611-3. ↑ Honnorat, J; Antoine JC (May 2007). "Paraneoplastic neurological syndromes". Orphanet Journal of Rare Diseases. BioMed Central. 2 (1): 22. doi:10.1186/1750-1172-2-22. PMC 1868710 . PMID 17480225. 1 2 Greene, Frederick L. (2002). AJCC cancer staging manual. Berlin: Springer-Verlag. ISBN 0-387-95271-3. ↑ Biesalski HK, Bueno de Mesquita B, Chesson A, et al. (1998). "European Consensus Statement on Lung Cancer: risk factors and prevention. Lung Cancer Panel". CA Cancer J Clin. Smoking is the major risk factor, accounting for about 90% of lung cancer incidence. 48 (3): 167–176; discussion 164–166. doi:10.3322/canjclin.48.3.167. PMID 9594919. 1 2 Hecht, SS (2012). "Lung carcinogenesis by tobacco smoke". International Journal of Cancer. 131 (12): 2724–2732. doi:10.1002/ijc.27816. PMC 3479369 . PMID 22945513. ↑ Kumar, V; Abbas AK; Aster JC (2013). "Chapter 5". Robbins Basic Pathology (9th ed.). Elsevier Saunders. p. 199. ISBN 978-1-4377-1781-5. ↑ Peto R, Lopez AD, Boreham J, et al. (2006). Mortality from smoking in developed countries 1950–2000: Indirect estimates from National Vital Statistics. Oxford University Press. ISBN 0-19-262535-7. ↑ California Environmental Protection Agency (1997). "Health effects of exposure to environmental tobacco smoke. California Environmental Protection Agency". Tobacco Control. 6 (4): 346–353. doi:10.1136/tc.6.4.346. PMC 1759599 . PMID 9583639. ↑ Centers for Disease Control and Prevention (CDC) (December 2001). "State-specific prevalence of current cigarette smoking among adults, and policies and attitudes about secondhand smoke—United States, 2000". Morbidity and Mortality Weekly Report. Atlanta, Georgia: CDC. 50 (49): 1101–1106. PMID 11794619. 1 2 3 Alberg, AJ; Samet JM (September 2007). "Epidemiology of lung cancer". Chest. American College of Chest Physicians. 132 (S3): 29S–55S. doi:10.1378/chest.07-1347. PMID 17873159. ↑ Jaakkola, MS; Jaakkola JJ (August 2006). "Impact of smoke-free workplace legislation on exposures and health: possibilities for prevention". European Respiratory Journal. 28 (2): 397–408. doi:10.1183/09031936.06.00001306. PMID 16880370. ↑ Parkin, DM (December 2011). "Tobacco—attributable cancer burden in the UK in 2010". British Journal of Cancer. 105 (Suppl. 2): S6–S13. doi:10.1038/bjc.2011.475. PMC 3252064 . PMID 22158323. 1 2 Taylor, R; Najafi F; Dobson A (October 2007). "Meta-analysis of studies of passive smoking and lung cancer: effects of study type and continent". International Journal of Epidemiology. 36 (5): 1048–1059. doi:10.1093/ije/dym158. PMID 17690135. ↑ "Frequently asked questions about second hand smoke". World Health Organization. Retrieved 25 July 2012. ↑ Schick, S; Glantz S (December 2005). "Philip Morris toxicological experiments with fresh sidestream smoke: more toxic than mainstream smoke". Tobacco Control. 14 (6): 396–404. doi:10.1136/tc.2005.011288. PMC 1748121 . PMID 16319363. ↑ Greydanus, DE; Hawver EK; Greydanus MM (October 2013). "Marijuana: current concepts". Frontiers in Public Health. 1 (42). doi:10.3389/fpubh.2013.00042. PMC 3859982 . PMID 24350211. ↑ Owen, KP; Sutter, ME; Albertson, TE (February 2014). "Marijuana: respiratory tract effects.". Clinical reviews in allergy & immunology. 46 (1): 65–81. doi:10.1007/s12016-013-8374-y. PMID 23715638. ↑ Joshi, M; Joshi, A; Bartter, T (March 2014). "Marijuana and lung diseases.". Current Opinion in Pulmonary Medicine. 20 (2): 173–179. doi:10.1097/mcp.0000000000000026. PMID 24384575. ↑ Tashkin, DP (June 2013). 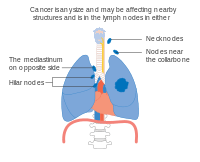 "Effects of marijuana smoking on the lung.". Annals of the American Thoracic Society. 10 (3): 239–47. doi:10.1513/annalsats.201212-127fr. PMID 23802821. ↑ Underner, M; Urban T; Perriot J (June 2014). "Cannabis smoking and lung cancer". Revue des Maladies Respiratoires. 31 (6): 488–498. doi:10.1016/j.rmr.2013.12.002. PMID 25012035. ↑ Choi, H; Mazzone, P (September 2014). "Radon and lung cancer: assessing and mitigating the risk". Cleveland Clinic Journal of Medicine. 81 (9): 567–575. doi:10.3949/ccjm.81a.14046. PMID 25183848. ↑ "Radon (Rn) Health Risks". EPA. ↑ EPA (February 2013). "Radiation information: radon". EPA. ↑ Tobias, J; Hochhauser D (2010). "Chapter 12". Cancer and its Management (6th ed.). Wiley-Blackwell. p. 199. ISBN 978-1405-170154. ↑ Davies, RJO; Lee YCG (2010). "18.19.3". Oxford Textbook Medicine (5th ed.). OUP Oxford. ISBN 978-0-19-920485-4. ↑ Chen, H; Goldberg MS; Villeneuve PJ (Oct–Dec 2008). "A systematic review of the relation between long-term exposure to ambient air pollution and chronic diseases". Reviews on Environmental Health. 23 (4): 243–297. doi:10.1515/reveh.2008.23.4.243. PMID 19235364. ↑ Clapp, RW; Jacobs MM; Loechler EL (Jan–Mar 2008). "Environmental and Occupational Causes of Cancer New Evidence, 2005–2007". Reviews on Environmental Health. 23 (1): 1–37. doi:10.1515/REVEH.2008.23.1.1. PMC 2791455 . PMID 18557596. 1 2 Lim, WY; Seow, A (January 2012). "Biomass fuels and lung cancer.". Respirology (Carlton, Vic.). 17 (1): 20–31. doi:10.1111/j.1440-1843.2011.02088.x. PMID 22008241. 1 2 Sood, A (December 2012). "Indoor fuel exposure and the lung in both developing and developed countries: an update.". Clinics in chest medicine. 33 (4): 649–65. doi:10.1016/j.ccm.2012.08.003. PMID 23153607. ↑ Yang, IA; Holloway, JW; Fong, KM (October 2013). "Genetic susceptibility to lung cancer and co-morbidities". Journal of Thoracic Disease. 5 (Suppl. 5): S454–S462. doi:10.3978/j.issn.2072-1439.2013.08.06. PMC 3804872 . PMID 24163739. ↑ Dela Cruz, CS; Tanoue, LT; Matthay, RA (2015). "Chapter 109: Epidemiology of lung cancer". In Grippi, MA; Elias, JA; Fishman, JA; Kotloff, RM; Pack, AI; Senior, RM. Fishman's Pulmonary Diseases and Disorders (5th ed.). McGraw-Hill. p. 1673. ISBN 978-0-07-179672-9. ↑ Larsen, JE; Minna D (December 2011). "Molecular biology of lung cancer: clinical implications". Clinics in Chest Medicine. 32 (4): 703–740. doi:10.1016/j.ccm.2011.08.003. PMC 3367865 . PMID 22054881. ↑ Cooper, WA; Lam DLC; O'Toole SA (October 2013). "Molecular biology of lung cancer" (PDF). Journal of Thoracic Disease. 5 (Suppl. 5): S. 479–490. doi:10.3978/j.issn.2072-1439.2013.08.03. PMC 3804875 . PMID 24163741. ↑ Tobias, J; Hochhauser D (2010). "Chapter 12". Cancer and its Management (6th ed.). Wiley-Blackwell. p. 200. ISBN 978-1405-170154. 1 2 3 4 Herbst, RS; Heymach JV; Lippman SM (September 2008). "Lung cancer". New England Journal of Medicine. 359 (13): 1367–1380. doi:10.1056/NEJMra0802714. PMID 18815398. ↑ Aviel-Ronen, S; Blackhall FH; Shepherd FA; Tsao MS (July 2006). "K-ras mutations in non-small-cell lung carcinoma: a review". Clinical Lung Cancer. Cancer Information Group. 8 (1): 30–38. doi:10.3816/CLC.2006.n.030. PMID 16870043. 1 2 Jakopovic, M; Thomas A; Balasubramaniam S (October 2013). "Targeting the epigenome in lung cancer: expanding approaches to epigenetic therapy" (PDF). Frontiers in Oncology. 3 (261). doi:10.3389/fonc.2013.00261. PMC 3793201 . PMID 24130964. 1 2 Mulvihill, MS; Kratz JR; Pham P (February 2013). "The role of stem cells in airway repair: implications for the origins of lung cancer". Chinese Journal of Cancer. 32 (2): 71–74. doi:10.5732/cjc.012.10097. PMC 3845611 . PMID 23114089. ↑ Powell, CA; Halmos B; Nana-Sinkam SP (July 2013). "Update in lung cancer and mesothelioma 2012" (PDF). American Journal of Respiratory and Critical Care Medicine. 188 (2): 157–166. doi:10.1164/rccm.201304-0716UP. PMC 3778761 . PMID 23855692. ↑ Ost, D (2015). "Chapter 110: Approach to the patient with pulmonary nodules". In Grippi, MA; Elias, JA; Fishman, JA; Kotloff, RM; Pack, AI; Senior, RM. Fishman's Pulmonary Diseases and Disorders (5th ed.). McGraw-Hill. p. 1685. ISBN 978-0-07-179672-9. ↑ Frank, L; Quint, LE (March 2012). "Chest CT incidentalomas: thyroid lesions, enlarged mediastinal lymph nodes, and lung nodules". Cancer Imaging. 12 (1): 41–48. doi:10.1102/1470-7330.2012.0006. PMC 3335330 . PMID 22391408. ↑ Smokers defined as current or former smoker of more than 1 year of duration. See image page in Commons for percentages in numbers. Reference: Table 2 in: Kenfield, S A; Wei, E K; Stampfer, M J; Rosner, B A; Colditz, G A (2008). 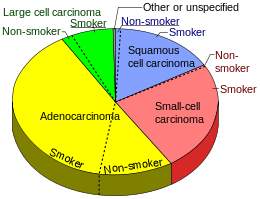 "Comparison of aspects of smoking among the four histological types of lung cancer". Tobacco Control. 17 (3): 198–204. doi:10.1136/tc.2007.022582. PMC 3044470 . PMID 18390646. 1 2 Kumar, V; Abbas AK; Aster JC (2013). "12". Robbins Basic Pathology (9th ed.). Elsevier Saunders. p. 505. ISBN 978-1-4377-1781-5. ↑ Subramanian, J; Govindan R (February 2007). "Lung cancer in never smokers: a review". Journal of Clinical Oncology. American Society of Clinical Oncology. 25 (5): 561–570. doi:10.1200/JCO.2006.06.8015. PMID 17290066. ↑ Rosti G, Bevilacqua G, Bidoli P, et al. (March 2006). 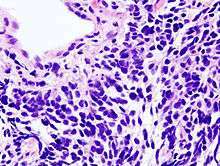 "Small cell lung cancer". Annals of Oncology. 17 (Suppl. 2): 5–10. doi:10.1093/annonc/mdj910. PMID 16608983. ↑ Seo JB, Im JG, Goo JM, et al. (1 March 2001). 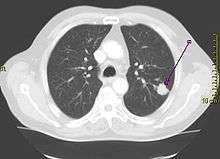 "Atypical pulmonary metastases: spectrum of radiologic findings". Radiographics. 21 (2): 403–417. doi:10.1148/radiographics.21.2.g01mr17403. PMID 11259704. ↑ Chheang, S; Brown K (June 2013). "Lung cancer staging: clinical and radiologic perspectives". Seminars in Interventional Radiology. 30 (2): 99–113. doi:10.1055/s-0033-1342950. PMC 3709937 . PMID 24436525. 1 2 3 Rami-Porta, R; Crowley JJ; Goldstraw P (February 2009). "The revised TNM staging system for lung cancer" (PDF). Annals of Thoracic and Cardiovascular Surgery. 15 (1): 4–9. PMID 19262443. ↑ Dela Cruz, CS; Tanoue LT; Matthay RA (December 2011). "Lung cancer: epidemiology, etiology, and prevention" (PDF). Clinic in Chest Medicine. 32 (4): 605–644. doi:10.1016/j.ccm.2011.09.001. PMC 3864624 . PMID 22054876. ↑ Goodman, GE (November 2002). "Lung cancer. 1: prevention of lung cancer" (PDF). Thorax. 57 (11): 994–999. doi:10.1136/thorax.57.11.994. PMC 1746232 . PMID 12403886. ↑ McNabola, A; Gill LW (February 2009). "The control of environmental tobacco smoke: a policy review". International Journal of Environmental Research and Public Health. 6 (2): 741–758. doi:10.3390/ijerph6020741. PMC 2672352 . PMID 19440413. ↑ Pandey, G (February 2005). "Bhutan's smokers face public ban". BBC. Retrieved 7 September 2007. ↑ Pandey, G (2 October 2008). "Indian ban on smoking in public". BBC. Retrieved 25 April 2012. ↑ "UN health agency calls for total ban on tobacco advertising to protect young" (Press release). United Nations News service. 30 May 2008. ↑ Gutierrez, A; Suh R; Abtin F (June 2013). "Lung cancer screening". Seminars in Interventional Radiology. 30 (2): 114–120. doi:10.1055/s-0033-1342951. PMC 3709936 . PMID 24436526. 1 2 Usman Ali, M; Miller, J; Peirson, L; Fitzpatrick-Lewis, D; Kenny, M; Sherifali, D; Raina, P (August 2016). "Screening for lung cancer: A systematic review and meta-analysis.". Preventive medicine. 89: 301–14. doi:10.1016/j.ypmed.2016.04.015. PMID 27130532. 1 2 Aberle, D. R.; Abtin, F.; Brown, K. (2013). "Computed Tomography Screening for Lung Cancer: Has It Finally Arrived? Implications of the National Lung Screening Trial". Journal of Clinical Oncology. 31 (8): 1002–1008. doi:10.1200/JCO.2012.43.3110. ISSN 0732-183X. PMID 23401434. ↑ Bach PB, Mirkin JN, Oliver TK, et al. (June 2012). "Benefits and harms of CT screening for lung cancer: a systematic review". JAMA. 307 (22): 2418–29. doi:10.1001/jama.2012.5521. PMC 3709596 . PMID 22610500. 1 2 Moyer, VA; U.S. Preventive Services Task, Force (Mar 4, 2014). "Screening for lung cancer: U.S. Preventive Services Task Force recommendation statement.". Annals of Internal Medicine. 160 (5): 330–8. doi:10.7326/M13-2771. PMID 24378917. ↑ Baldwin, DR; Hansell, DM; Duffy, SW; Field, JK (Mar 7, 2014). "Lung cancer screening with low dose computed tomography.". BMJ (Clinical research ed.). 348: g1970. doi:10.1136/bmj.g1970. PMID 24609921. 1 2 3 Fabricius, P; Lange P (July–September 2003). "Diet and lung cancer". Monaldi Archives for Chest Disease. 59 (3): 207–211. PMID 15065316. ↑ Fritz H, Kennedy D, Fergusson D, et al. (2011). "Vitamin A and Retinoid Derivatives for Lung Cancer: A Systematic Review and Meta Analysis". PLoS ONE. 6 (6): e21107. doi:10.1371/journal.pone.0021107. PMC 3124481 . PMID 21738614. ↑ Herr C, Greulich T, Koczulla RA, et al. (March 2011). "The role of vitamin D in pulmonary disease: COPD, asthma, infection, and cancer". Respiratory Research. 12 (1): 31. doi:10.1186/1465-9921-12-31. PMC 3071319 . PMID 21418564. 1 2 Key, TJ (January 2011). "Fruit and vegetables and cancer risk". British Journal of Cancer. 104 (1): 6–11. doi:10.1038/sj.bjc.6606032. PMC 3039795 . PMID 21119663. ↑ Bradbury, KE; Appleby, PN; Key, TJ (June 2014). "Fruit, vegetable, and fiber intake in relation to cancer risk: findings from the European Prospective Investigation into Cancer and Nutrition (EPIC)". American Journal of Clinical Nutrition. 100 (Suppl. 1): 394S–398S. doi:10.3945/ajcn.113.071357. PMID 24920034. ↑ Ferrell, B; Koczywas M; Grannis F; Harrington A (April 2011). "Palliative care in lung cancer". Surgical Clinics of North America. 91 (2): 403–417. doi:10.1016/j.suc.2010.12.003. PMID 21419260. ↑ Chang, L; Rivera, MP (2015). "Chapter 112: Clinical evaluation, diagnosis, and staging of lung cancer". In Grippi, MA; Elias, JA; Fishman, JA; Kotloff, RM; Pack, AI; Senior, RM. Fishman's Pulmonary Diseases and Disorders (5th ed.). McGraw-Hill. p. 1728. ISBN 978-0-07-179672-9. ↑ Reznik, SI; Smythe, WR (2015). "Chapter 113: Treatment of non-small-cell lung cancer: surgery". In Grippi, MA; Elias, JA; Fishman, JA; Kotloff, RM; Pack, AI; Senior, RM. Fishman's Pulmonary Diseases and Disorders (5th ed.). McGraw-Hill. p. 1737–1738. ISBN 978-0-07-179672-9. ↑ Alam, N; Flores RM (July–September 2007). "Video-assisted thoracic surgery (VATS) lobectomy: the evidence base". Journal of the Society of Laparoendoscopic Surgeons. 11 (3): 368–374. PMC 3015831 . PMID 17931521. ↑ Rueth, NM; Andrade RS (June 2010). "Is VATS lobectomy better: perioperatively, biologically and oncologically?". Annals of Thoracic Surgery. 89 (6): S2107–S2111. doi:10.1016/j.athoracsur.2010.03.020. PMID 20493991. ↑ Goldstein, SD; Yang SC (October 2011). "Role of surgery in small cell lung cancer". Surgical Oncology Clinics of North America. 20 (4): 769–777. doi:10.1016/j.soc.2011.08.001. PMID 21986271. ↑ Arriagada, R; Goldstraw P; Le Chevalier T (2002). Oxford Textbook of Oncology (2nd ed.). Oxford University Press. p. 2094. ISBN 0-19-262926-3. ↑ Hatton, MQ; Martin JE (June 2010). "Continuous hyperfractionated accelerated radiotherapy (CHART) and non-conventionally fractionated radiotherapy in the treatment of non-small cell lung cancer: a review and consideration of future directions". Clinical Oncology (Royal College of Radiologists). 22 (5): 356–364. doi:10.1016/j.clon.2010.03.010. PMID 20399629. ↑ PORT Meta-analysis Trialists Group (2005). Rydzewska, Larysa, ed. "Postoperative radiotherapy for non-small cell lung cancer". Cochrane Database of Systematic Reviews (2): CD002142. doi:10.1002/14651858.CD002142.pub2. PMID 15846628. ↑ Le Péchoux, C (2011). "Role of postoperative radiotherapy in resected non-small cell lung cancer: a reassessment based on new data". Oncologist. 16 (5): 672–681. doi:10.1634/theoncologist.2010-0150. PMC 3228187 . PMID 21378080. ↑ Ikushima, H (February 2010). "Radiation therapy: state of the art and the future". Journal of Medical Investigation. 57 (1–2): 1–11. doi:10.2152/jmi.57.1. PMID 20299738. ↑ Reveiz, L; Rueda, JR; Cardona, AF (12 December 2012). "Palliative endobronchial brachytherapy for non-small cell lung cancer". The Cochrane database of systematic reviews. 12: CD004284. doi:10.1002/14651858.CD004284.pub3. PMID 23235606. ↑ Paumier, A; Cuenca X; Le Péchoux C (June 2011). "Prophylactic cranial irradiation in lung cancer". Cancer Treatment Reviews. 37 (4): 261–265. doi:10.1016/j.ctrv.2010.08.009. PMID 20934256. ↑ Girard, N; Mornex F (October 2011). "Stereotactic radiotherapy for non-small cell lung cancer: From concept to clinical reality. 2011 update". Cancer Radiothérapie. 15 (6–7): 522–526. doi:10.1016/j.canrad.2011.07.241. PMID 21889901. ↑ Fairchild A, Harris K, Barnes E, et al. (August 2008). "Palliative thoracic radiotherapy for lung cancer: a systematic review". Journal of Clinical Oncology. 26 (24): 4001–4011. doi:10.1200/JCO.2007.15.3312. PMID 18711191. ↑ Hann CL, Rudin CM (30 November 2008). "Management of small-cell lung cancer: incremental changes but hope for the future". Oncology (Williston Park). 22 (13): 1486–92. PMID 19133604. ↑ Murray, N; Turrisi AT (March 2006). "A review of first-line treatment for small-cell lung cancer". Journal of Thoracic Oncology. 1 (3): 270–278. PMID 17409868. ↑ Azim, HA; Ganti AK (March 2007). "Treatment options for relapsed small-cell lung cancer". Anti-Cancer Drugs. 18 (3): 255–261. doi:10.1097/CAD.0b013e328011a547. PMID 17264756. ↑ MacCallum, C; Gillenwater HH (July 2006). "Second-line treatment of small-cell lung cancer". Current Oncology Reports. 8 (4): 258–264. doi:10.1007/s11912-006-0030-8. PMID 17254525. ↑ Carr, LL; Jett, JR (2015). "Chapter 114: Treatment of non-small-cell lung cancer: chemotherapy". In Grippi, MA; Elias, JA; Fishman, JA; Kotloff, RM; Pack, AI; Senior, RM. Fishman's Pulmonary Diseases and Disorders (5th ed.). McGraw-Hill. p. 1752. ISBN 978-0-07-179672-9. 1 2 Clegg A, Scott DA, Hewitson P, et al. (January 2002). "Clinical and cost effectiveness of paclitaxel, docetaxel, gemcitabine, and vinorelbine in non-small cell lung cancer: a systematic review". Thorax. BMJ Publishing Group. 57 (1): 20–28. doi:10.1136/thorax.57.1.20. PMC 1746188 . PMID 11809985. ↑ Carbone, DP; Felip E (September 2011). "Adjuvant therapy in non-small cell lung cancer: future treatment prospects and paradigms". 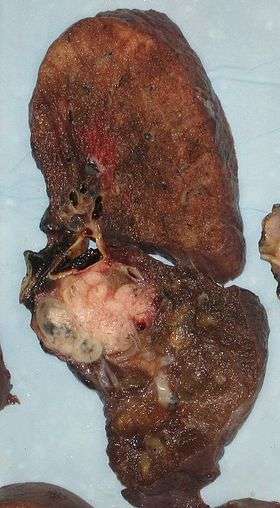 Clinical Lung Cancer. 12 (5): 261–271. doi:10.1016/j.cllc.2011.06.002. PMID 21831720. 1 2 Le Chevalier, T (October 2010). "Adjuvant chemotherapy for resectable non-small-cell lung cancer: where is it going?". Annals of Oncology. 21 (Suppl. 7): vii196–198. doi:10.1093/annonc/mdq376. PMID 20943614. ↑ Horn, L; Sandler AB; Putnam JB Jr; Johnson DH (May 2007). "The rationale for adjuvant chemotherapy in stage I non-small cell lung cancer". Journal of Thoracic Oncology. 2 (5): 377–383. doi:10.1097/01.JTO.0000268669.64625.bb. PMID 17473651. ↑ Wakelee, HA; Schiller JH; Gandara DR (July 2006). "Current status of adjuvant chemotherapy for stage IB non-small-cell lung cancer: implications for the New Intergroup Trial". Clinical Lung Cancer. Cancer Information Group. 8 (1): 18–21. doi:10.3816/CLC.2006.n.028. PMID 16870041. ↑ NSCLC Meta-analysis Collaborative, Group (May 3, 2014). "Preoperative chemotherapy for non-small-cell lung cancer: a systematic review and meta-analysis of individual participant data.". Lancet. 383 (9928): 1561–71. doi:10.1016/S0140-6736(13)62159-5. PMC 4022989 . PMID 24576776. ↑ Souquet PJ, Chauvin F, Boissel JP, Bernard JP (April 1995). "Meta-analysis of randomised trials of systemic chemotherapy versus supportive treatment in non-resectable non-small cell lung cancer". Lung Cancer. 12 Suppl 1: S147–54. doi:10.1016/0169-5002(95)00430-9. PMID 7551923. ↑ Clegg A, Scott DA, Sidhu M, Hewitson P, Waugh N (2001). "A rapid and systematic review of the clinical effectiveness and cost-effectiveness of paclitaxel, docetaxel, gemcitabine and vinorelbine in non-small-cell lung cancer". Health Technology Assessment. 5 (32): 1–195. PMID 12065068. ↑ Non-Small Cell Lung Cancer Collaborative, Group (12 May 2010). "Chemotherapy and supportive care versus supportive care alone for advanced non-small cell lung cancer.". The Cochrane database of systematic reviews (5): CD007309. doi:10.1002/14651858.CD007309.pub2. PMID 20464750. ↑ D'Antonio; Passaro A; Gori B (May 2014). "Bone and brain metastasis in lung cancer: recent advances in therapeutic strategies". Therapeutic Advances in Medical Oncology. 6 (3): 101–114. doi:10.1177/1758834014521110. PMC 3987652 . PMID 24790650. ↑ Lazarus, DR; Eapen, GA (2014). "Chapter 16: Bronchoscopic interventions for lung cancer". In Roth, JA; Hong, WK; Komaki, RU. Lung Cancer (4th ed.). Wiley-Blackwell. ISBN 978-1-118-46874-6. ↑ Khemasuwan, D; Mehta, AC; Wang, KP (December 2015). "Past, present, and future of endobronchial laser photoresection". Journal of Thoracic Disease. 7 (Suppl. 4): S380–S388. doi:10.3978/j.issn.2072-1439.2015.12.55. PMC 4700383 . PMID 26807285. ↑ Parikh, RB; Kirch, RA; Smith, TJ; Temel, JS (12 December 2013). "Early specialty palliative care--translating data in oncology into practice.". The New England Journal of Medicine. 369 (24): 2347–51. doi:10.1056/nejmsb1305469. PMC 3991113 . PMID 24328469. ↑ Kelley AS, Meier DE (August 2010). "Palliative care—a shifting paradigm". New England Journal of Medicine. 363 (8): 781–2. doi:10.1056/NEJMe1004139. PMID 20818881. 1 2 Prince-Paul M (April 2009). "When hospice is the best option: an opportunity to redefine goals". Oncology (Williston Park, N.Y.). 23 (4 Suppl Nurse Ed): 13–7. PMID 19856592. ↑ Ridge, CA; McErlean AM; Ginsberg MS (June 2013). "Epidemiology of lung cancer". Seminars in Interventional Radiology. 30 (2): 93–98. doi:10.1055/s-0033-1342949. PMC 3709917 . PMID 24436524. 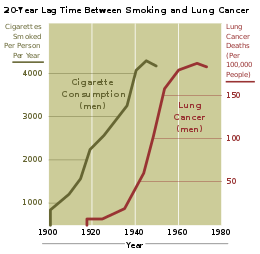 ↑ "Lung cancer survival statistics". Cancer Research UK. 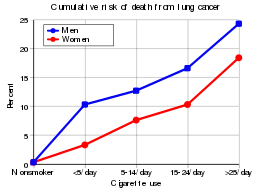 ↑ "Lung cancer survival statistics". Retrieved 28 October 2014. ↑ "Non-Small Cell Lung Cancer Treatment". PDQ for Health Professionals. National Cancer Institute. PMID 26389304. Retrieved 17 November 2015. ↑ "Small Cell Lung Cancer Treatment". PDQ for Health Professionals. National Cancer Institute. 2012. Retrieved 16 May 2012. ↑ Spiro, SG (2010). "18.19.1". Oxford Textbook Medicine (5th ed.). OUP Oxford. ISBN 978-0-19-920485-4. ↑ Slatore, CG; Au DH; Gould MK (November 2010). "An official American Thoracic Society systematic review: insurance status and disparities in lung cancer practices and outcomes". American Journal of Respiratory and Critical Care Medicine. 182 (9): 1195–1205. doi:10.1164/rccm.2009-038ST. PMID 21041563. ↑ Stewart, edited by Bernard W.; Wild, Christopher P. (2014). World cancer report 2014. Lyon: IARC Press. pp. 350–352. ISBN 9789283204299. ↑ Jemal A, Tiwari RC, Murray T, et al. (2004). "Cancer statistics, 2004". CA: A Cancer Journal for Clinicians. 54 (1): 8–29. doi:10.3322/canjclin.54.1.8. PMID 14974761. ↑ Proctor, RN (March 2012). "The history of the discovery of the cigarette-lung cancer link: evidentiary traditions, corporate denial, global toll". Tobacco Control. 21 (2): 87–91. doi:10.1136/tobaccocontrol-2011-050338. PMID 22345227. ↑ Lum, KL; Polansky JR; Jackler RK; Glantz SA (October 2008). "Signed, sealed and delivered: "big tobacco" in Hollywood, 1927–1951". Tobacco Control. 17 (5): 313–323. doi:10.1136/tc.2008.025445. PMC 2602591 . PMID 18818225. ↑ Lovato, C; Watts A; Stead LF (October 2011). "Impact of tobacco advertising and promotion on increasing adolescent smoking behaviours". Cochrane Database of Systematic Reviews (10): CD003439. doi:10.1002/14651858.CD003439.pub2. PMID 21975739. ↑ Kemp, FB (Jul–Sep 2009). "Smoke free policies in Europe. An overview". Pneumologia. 58 (3): 155–158. PMID 19817310. ↑ "Gender in lung cancer and smoking research" (PDF). World Health Organization. 2004. Retrieved 26 May 2007. ↑ Zhang, J; Ou JX; Bai CX (November 2011). "Tobacco smoking in China: prevalence, disease burden, challenges and future strategies". Respirology. 16 (8): 1165–1172. doi:10.1111/j.1440-1843.2011.02062.x. PMID 21910781. ↑ "HONORING VETERANS WITH GOOD HEALTH". November 7, 2014. Retrieved 1 December 2015. ↑ "Lung Cancer As It Affects Veterans And Military". Retrieved 1 December 2015. ↑ "Lung cancer statistics". Cancer Research UK. Retrieved 28 October 2014. ↑ Charloux A, Quoix E, Wolkove N, et al. (February 1997). "The increasing incidence of lung adenocarcinoma: reality or artefact? A review of the epidemiology of lung adenocarcinoma". International Journal of Epidemiology. 26 (1): 14–23. doi:10.1093/ije/26.1.14. PMID 9126499. ↑ Kadara, H; Kabbout M; Wistuba II (January 2012). "Pulmonary adenocarcinoma: a renewed entity in 2011". Respirology. 17 (1): 50–65. doi:10.1111/j.1440-1843.2011.02095.x. PMID 22040022. ↑ Bayle, Gaspard-Laurent (1810). Recherches sur la phthisie pulmonaire (in French). Paris. OL 15355651W. 1 2 Witschi, H (November 2001). "A short history of lung cancer". Toxicological Sciences. 64 (1): 4–6. doi:10.1093/toxsci/64.1.4. PMID 11606795. ↑ Adler, I (1912). Primary Malignant Growths of the Lungs and Bronchi. New York: Longmans, Green, and Company. OCLC 14783544. OL 24396062M. , cited in Spiro SG, Silvestri GA (2005). "One hundred years of lung cancer". American Journal of Respiratory and Critical Care Medicine. 172 (5): 523–529. doi:10.1164/rccm.200504-531OE. PMID 15961694. ↑ Grannis, FW. "History of cigarette smoking and lung cancer". smokinglungs.com. Archived from the original on 18 July 2007. Retrieved 6 August 2007. ↑ Proctor, R (2000). The Nazi War on Cancer. Princeton University Press. pp. 173–246. ISBN 0-691-00196-0. ↑ Doll, R; Hill AB (November 1956). "Lung Cancer and Other Causes of Death in Relation to Smoking". British Medical Journal. 2 (5001): 1071–1081. doi:10.1136/bmj.2.5001.1071. PMC 2035864 . PMID 13364389. 1 2 Greaves, M (2000). 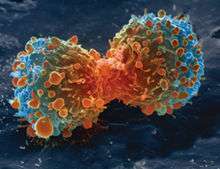 Cancer: the Evolutionary Legacy. Oxford University Press. pp. 196–197. ISBN 0-19-262835-6. ↑ Greenberg, M; Selikoff IJ (February 1993). "Lung cancer in the Schneeberg mines: a reappraisal of the data reported by Harting and Hesse in 1879". Annals of Occupational Hygiene. 37 (1): 5–14. doi:10.1093/annhyg/37.1.5. PMID 8460878. ↑ Samet, JM (April 2011). "Radiation and cancer risk: a continuing challenge for epidemiologists". Environmental Health. 10 (Suppl. 1): S4. doi:10.1186/1476-069X-10-S1-S4. PMC 3073196 . PMID 21489214. ↑ Horn, L; Johnson DH (July 2008). "Evarts A. Graham and the first pneumonectomy for lung cancer". Journal of Clinical Oncology. 26 (19): 3268–3275. doi:10.1200/JCO.2008.16.8260. PMID 18591561. ↑ Edwards, AT (1946). "Carcinoma of the Bronchus". Thorax. 1 (1): 1–25. doi:10.1136/thx.1.1.1. PMC 1018207 . PMID 20986395. ↑ Kabela, M (1956). "Erfahrungen mit der radikalen Röntgenbestrahlung des Bronchienkrebses" [Experience with radical irradiation of bronchial cancer]. Ceskoslovenská Onkológia (in German). 3 (2): 109–115. PMID 13383622. ↑ Saunders M, Dische S, Barrett A, et al. (July 1997). "Continuous hyperfractionated accelerated radiotherapy (CHART) versus conventional radiotherapy in non-small-cell lung cancer: a randomised multicentre trial". Lancet. Elsevier. 350 (9072): 161–165. doi:10.1016/S0140-6736(97)06305-8. PMID 9250182. ↑ Lennox SC, Flavell G, Pollock DJ, et al. (November 1968). "Results of resection for oat-cell carcinoma of the lung". Lancet. Elsevier. 2 (7575): 925–927. doi:10.1016/S0140-6736(68)91163-X. PMID 4176258. ↑ Miller, AB; Fox W; Tall R (September 1969). "Five-year follow-up of the Medical Research Council comparative trial of surgery and radiotherapy for the primary treatment of small-celled or oat-celled carcinoma of the bronchus". Lancet. Elsevier. 2 (7619): 501–505. doi:10.1016/S0140-6736(69)90212-8. PMID 4184834. 1 2 3 4 Brahmer, JR (February 2014). "Immune checkpoint blockade: the hope for immunotherapy as a treatment of lung cancer?". Seminars in oncology. 41 (1): 126–32. doi:10.1053/j.seminoncol.2013.12.014. PMID 24565586. ↑ Powell, CA; Halmos, B; Nana-Sinkam, SP (July 2013). "Update in lung cancer and mesothelioma 2012". American Journal of Respiratory and Critical Care Medicine. 188 (2): 157–166. doi:10.1164/rccm.201304-0716UP. PMC 3778761 . PMID 23855692. 1 2 Forde, PM; Brahmer, JR; Kelly, RJ (1 May 2014). "New strategies in lung cancer: epigenetic therapy for non-small cell lung cancer.". Clinical Cancer Research. 20 (9): 2244–8. doi:10.1158/1078-0432.ccr-13-2088. PMID 24644000. 1 2 Jamal-Hanjani, M; Hackshaw, A; Ngai, Y; et al. (July 2014). "Tracking genomic cancer evolution for precision medicine: the lung TRACERx study.". PLOS Biology. 12 (7): e1001906. doi:10.1371/journal.pbio.1001906. PMC 4086714 . PMID 25003521. ↑ Spaans, JN; Goss, GD (August 2014). "Trials to overcome drug resistance to EGFR and ALK targeted therapies—past, present, and future". Frontiers in Oncology. 4 (233). doi:10.3389/fonc.2014.00233. PMC 4145253 . PMID 25221748. 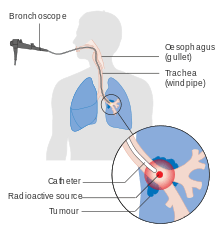 Wikimedia Commons has media related to Lung cancers.